>> Replace bcm. Refer to bcs-73, "removal and installation". 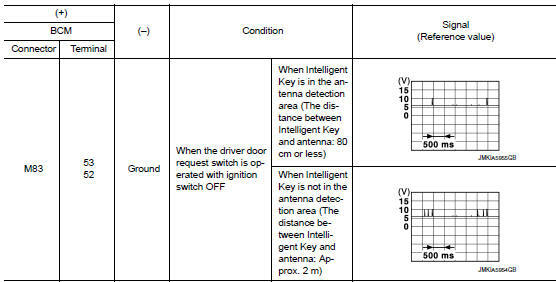 Select INTELLIGENT KEY of BCM using CONSULT. Select INSIDE ANT DIAGNOSIS in WORK SUPPORT mode. 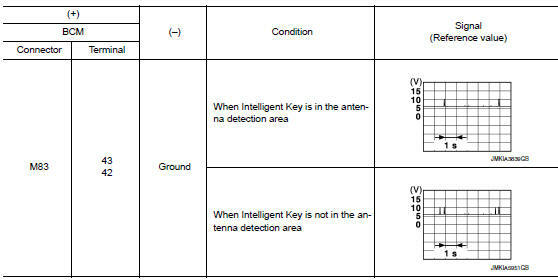 Perform inside key antenna (INSIDE ANT DIAGNOSIS) on WORK SUPPORT of INTELLIGENT KEY. Is inside key antenna DTC detected? YES >> Refer to DLK-72, "Diagnosis Procedure". NO >> Inside key antenna (instrument center) is OK. 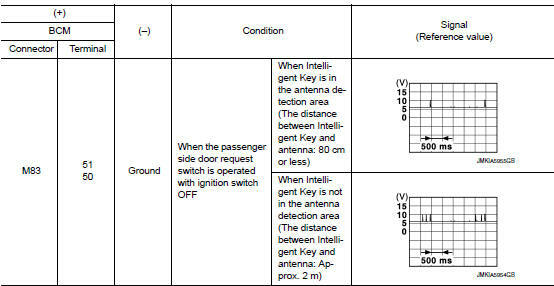 Regarding wiring diagram information, refer to dlk-49, "wiring diagram". Check signal between bcm harness connector and ground using oscilloscope. Is the inspection result normal? Yes >> replace bcm. Refer to bcs-73, "removal and installation". Disconnect bcm connector and inside key antenna (instrument center) connector. Check continuity between bcm harness connector and inside key antenna (instrument center) harness connector. Connect bcm connector and inside key antenna (instrument center) connector. Is the inspection result normal? Yes >> replace inside key antenna (instrument center). 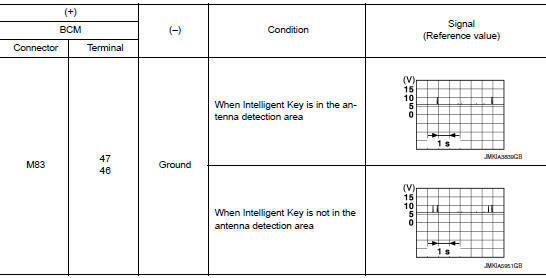 Is inside key antenna dtc detected? Yes >> refer to dlk-75, "diagnosis procedure". 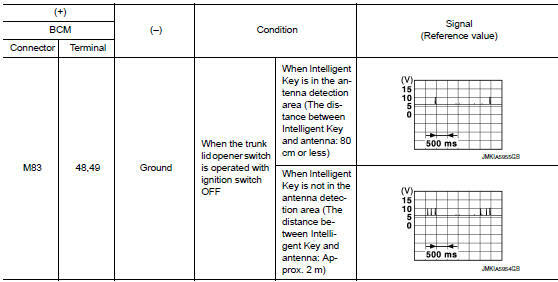 No >> inside key antenna (console) is ok. Check continuity between bcm harness connector and inside key antenna (console) harness connector. Connect bcm connector and inside key antenna (console) connector. Is the inspection result normal? Yes >> replace inside key antenna (console). Is inside key antenna dtc detected? Yes >> refer to dlk-78, "diagnosis procedure". No >> inside key antenna (trunk room) is ok. Disconnect BCM connector and inside key antenna (trunk room) connector. Check continuity between BCM harness connector and inside key antenna (trunk room) harness connector. Connect bcm connector and inside key antenna (trunk room) connector. Is the inspection result normal? 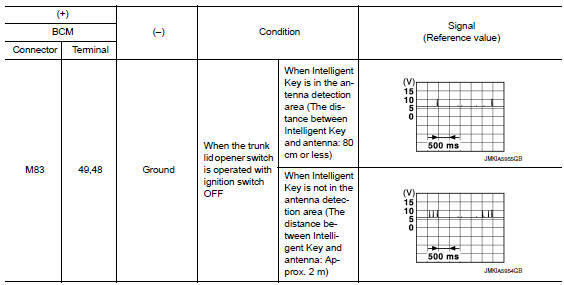 Yes >> replace inside key antenna (trunk room). Check вЂњSelf Diagnostic ResultвЂќ mode of вЂњBCMвЂќ using CONSULT. Is DTC detected? YES >> Refer to DLK-81, "Diagnosis Procedure". 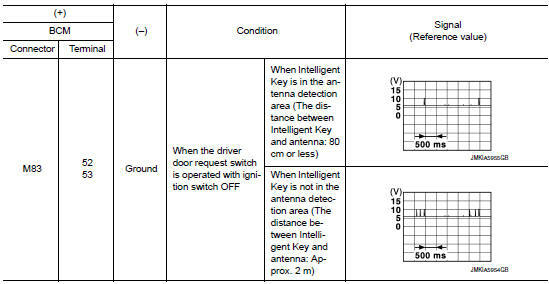 NO >> Outside key antenna (driver side) is OK. Disconnect bcm connector and outside key antenna (driver side) connector. Check continuity between bcm harness connector and outside key antenna (driver side) harness connector. Connect bcm connector and outside key antenna (driver side) connector. Is the inspection result normal? Yes >> replace outside key antenna (driver side). Check self diagnostic result mode of bcm using consult. Is outside key antenna dtc detected? Yes >> refer to dlk-84, "diagnosis procedure". 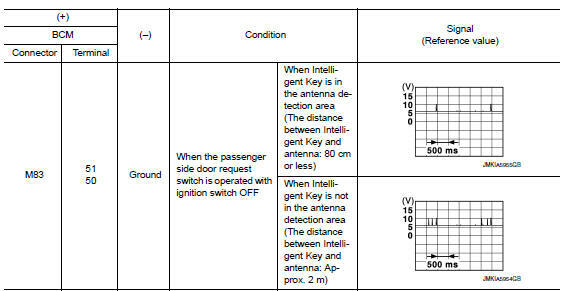 No >> outside key antenna (passenger side) is ok. Disconnect BCM connector and outside key antenna (passenger side) connector. Check continuity between bcm harness connector and outside key antenna (passenger side) harness connector. Connect bcm connector and outside key antenna (passenger side) connector. Is the inspection result normal? Yes >> replace outside key antenna (passenger side). Is outside key antenna dtc detected? Yes >> refer to dlk-87, "diagnosis procedure". No >> outside key antenna (rear bumper) is ok. Disconnect bcm connector and outside key antenna (rear bumper) connector. Check continuity between bcm harness connector and outside key antenna (rear bumper) harness connector. Connect bcm and outside key antenna (rear bumper) connector. Is the inspection result normal? Yes >> replace outside key antenna (rear bumper).